What needs to be done to improve or change the R&D productivity of the pharmaceutical industry? Is biotech consolidation the answer, and if not, what is? Many think that 2007 may be regarded as the year that Big Pharma went beyond merely embracing biotechnology, but decided that consolidation with its biologics breathren may well be the answer to the many problems currently plagueing them. Over the past couple of decades, Big Pharma has consolidated with other Big and mid-size Pharma companies in a so called Pharma-Pharma consolidation. This Pharma-Pharma consolidation occurred several times and with it brought about ever-larger companies with even-greater drug pipelines. The goal was to acquire pipelines from rival companies to boost revenues and, in some cases, scientific capabilities in key growth disease areas. But this approach eventually would not be sustainable as the primary means for new drug discovery and development. Times have changed. The pharmaceutical industry, as we know it today, can be traced back to about 150 years when the source of pharmaceuticals was from nature. Plants and organisms played a vital role in establishing the mainstay of drug pipelines. The strategy was to improve upon the natural biological properties and deliver the compounds in a format that modern humans could take and comply with. The advent of small molecule drugs came about because of their availability for discovery, development and their ability to provide for "incremental" development strategies. These incremental strategies of creating synthetic molecules, in what we now call medicinal chemistry, allowed for smaller molecule drugs and less risky development changes to the parent compound. These new derivatives of a proven drug or family of drugs have become commonplace and have defined the scope of the large pharmaceuticals to this day. According to analysts, small molecules still dominate the overall number of new drug candidates being developed with 135 out of 254 (53.1%) entering the Phase I human clinical trial process in 2007. These figures are based on the records of Investigation of New Drug Applications (INDs) submitted to the US FDA and announced by drug companies from around the world. Although this may sound impressive for pre-clinical candidates entering Phase I, according to the latest statistics from the Tufts University Drug Development Study and the trade association of large pharmaceuticals companies, Pharmaceutical Research and Manufacturers of America (PhRMA), the drug attrition rates are still one in ten of making it to that market: a mere 25 drugs out of 254 entered Phase I in 2007. Sources: Pharmaceutical Research and Manufacturers (PhRMA) Annual Report 2007; Burill & CompanyReport 2003; PhRMA Annual Member Survey, 2007: US Food & Drug Administration Databases. The Big Pharma spent over US$ 55.2 billion in 2006 (2007 estimates are over US$ 63 billion) on drug R&D a 100% increase over the US$ 26 billion they spent in the year 2000 with a declining number of drug approvals after that according to the PhRMA report released in 2007. 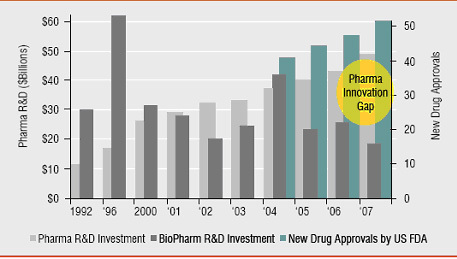 This so-called pharma innovation gap is huge and getting larger each year. So why still focus on the small molecule approach? Although not revolutionary, it provides a limited source of continuing drug candidates along with new and extended forms of intellectual property protection. Combining small molecule pipeline strategies with other drug product / formulation strategies will give greater leverage to the research and development efforts of these larger pharmaceutical companies. If it weren't for a lack of innovation on the part of Big Pharma companies, the Biotechnology industry as we know it today would probably have not existed as an industry, but would have been another chapter in the evolution of Big Pharma. We all know that large organisations struggle with creativity, entrepreneurship and original thinking. But large organisations can thrive on execution of ideas (sales and marketing), and the later-stage development of products (manufacturing). A creative and original thinking movement began out of the seminal discoveries that were occurring in the late 1970s in the biology and chemistry disciplines. These discoveries quickly grew into a nascent industry that would change the way drugs would be discovered, designed, developed and administered. With the advent of the discovery of DNA and the ability to manipulate it in the 1970s and 1980s, came a new science of genetic engineering that promised to fulfil the shortcomings of the pharma industry. The commercial aspect of the Biotech industry started out slowly in the early 1980s, but has become one of the fastest growing and strategically important industries of the 21st century. Big Pharma lost US$ 14 billion worth of annual drug sales to patent expirations in 2006 and is expected to lose another US$ 12 billion in 2007, according to IMS Health. But biotechs don't have this problem, at least not yet. They don't have to compete with "biogenerics" because the USFDA hasn't created a system for regulating them, which is a requirement for drug companies to get their products onto the market. Europe has proposals, but implementation may prove to be more difficult than originally thought. Costs to market drugs to consumers are exceeding the costs of drug R&D; this puts companies at risk of not directing enough resources to developing drugs. The current Direct-to-Consumer marketing strategy is creating a larger problem as less drugs are developed and more are coming off patent. Spending should be in R&D, not promotion of existing drugs. Another issue that is plaguing Big Pharma is the increasing cost to market drugs to the healthcare consumers. In a January 2008 published study in the Public Library of Science (PLoS), Marc-Andre Gagnon and Joel Lexchin conducted a study that showed that Big Pharma spent almost twice as much on marketing and promoting their drugs than on R&D. The pair analysed data from market research companies IMS and CAM and found that Big Pharma spent US$ 57.5 billion on promotional activities in 2004. By comparison, spending on pharmaceutical R&D in the US was US$ 31.5 billion in the same year, according to a report by the National Science Foundation. Biotech drugs or biopharmaceuticals are made out of living biological compounds and provide some attractive alternatives to synthetic small molecules that create traditional pharmaceuticals today. Although there is strong regulatory and political support in Europe for Biosimiliars (biological generics) and strong resistance to date in the US (where there is still predominance with the most drugs being developed in the US) with the FDA, the complexities of redesign, manufacturing and generating economies of scale in production costs could be some obstacles for certain biosimiliars than others. Big Biotechs can provide new scientific capabilities, knowledge in new drug classes and revenue generation potential for the Big Pharmas. This latest trend shows no signs of slowing down in the next couple of years. Although it should be noted that the number of viable candidates will diminish over time and force a movement towards more creative options. Many of these creative options have started with some Big Pharmas taking the proactive approach and implementing some potentially very accretive plans. Could these be just short-term trends or longer-term models of commercialisation? A few companies have started deploying more original strategies out of necessity and 2007 had seen some first-mover tactics which could become the trends for the next few years. Are generics really that bad? Generics, if proactively incorporated into a drug portfolio, can provide for additional growth in a broader drug portfolio management strategy. In many pharma companies, life cycle management could be adjusted to incorporate their own generics instead of planning on how to "defend" against them once the patent protection expires. In fact, Novartis has made it a part of its aggressive strategic plan. It has seen generics as part of its product line and market penetration strategy by using M&A to gain new groups. Many of the pharmaceutical companies in the Indian sub-continent are now realising the importance of having both generic and ethical / prescription drugs in their marketing efforts to improve growth and revenues. • Strategies for developing generic biotech drugs will be harder to do from both a regulatory and technical standpoint. Because taking on biopharmaceuticals means learning and hiring a large amount of people with a different set of skills and knowledge can be daunting for single in-licensing or acquisition scenarios, it may be better to take on a complete company with larger capabilities that could be integrated well with a Big Pharma. Some examples from 2007 are the US biotech, MedImmune's, acquisition for US$ 1.6 billion by AstraZeneca Plc to integrate with its prior acquisition of Cambridge Antibody Technologies (CAT) of the UK to form a very large and capable foundation for the creation of a biotechnology division. AstraZeneca also added the UK firm, Arrow Therapeutics to expand their original science in infectious diseases along with drug candidates for development. Others are taking on more original thinking and entrepreneurship with a long-term view of drug development by setting up incubators with an idea of turning them into scientific centres of excellence. Pfizer announced in late 2007 its intention of setting up a biotech research centre in California, similar in concept to Xerox's PARC centre that launched dozens of products and developed cutting-edge technologies, by investing huge amounts to setup and finance the existing technologies. Aventis moved quickly to acquire Sanofi and is aggressively pursuing more sizable biotech buyouts in the not too distant future. Most of the Big Pharmas will continue to transform their drug pipelines with consolidations of biopharmaceuticals for several years to come. the pharma industry now. According to the data released by IMS Health in 2007, the sales of US biotech grew 20% to US$ 40.3 billion in 2006, while pharma sales grew by only 8% to US$ 275 billion. Another consideration is the size or economies of scale. The sheer size of Big Pharma, if they could become more creative with these alternative strategies, could bring advantages in several critical areas for biotech companies, especially through complete acquisitions by the Big Pharma. The large size of a Big Pharma company provides an edge in launching and promoting new drugs or additional indications or formulations. A large company can increase the number of bets that it can place on new technologies, novel therapies or additional disease indicators. If a big pharma company manages its clinical programmes well, it can do the clinical trials both in-house as well as outsource to Contract Research Organisations (CROs) to help it complete clinical trials more quickly and broadly. The growth of Asia as both a technology and manufacturing region has become more mature in terms of product manufacturing and clinical trial programmes. Also, growth in original research represents a vast new population of people who would serve a growing pharmaceutical market. Just as generics provide for a greater opportunity with expanding drug portfolios and life cycle management challenges, a new and emerging group of product categories and technologies could provide new proprietary market growth to augment and complement the addition of biotech products and technologies. Many companies are expanding their product offerings and are diversifying outside traditional prescription drug formats. The accretive strategies table shows some of the more accretive new strategies currently being employed by pharmaceutical companies to expand product portfolios and growing more protected revenues. In the end, larger Pharma companies will have to take a broader look at how they serve the overall healthcare marketplace and provide, where needed, focussed solutions to unmet medical and healthcare problems. An expand and contract scenario is most likely with Big Pharma reaching a point of critical mass where they will have to find ways to deconsolidate and yet, control the development and expansion of its estate of drugs and intellectual property. The biotechnology industry has provided and will continue to provide cutting-edge science, innovated technologies and products that Big Pharma will be interested in. Biotech provides some, but not all, of the answers to the growth problems Big Pharma faces in the years to come. Value Drivers: Alternative growth strategies? Nutraceuticals are fast becoming a strong growth category with the global market valued at the retail level, was approximately US$ 110 billion in 2005 according to the American Chemistry Report. Nutraceuticals are pharmaceutical-grade, cGMP manufactured products that can provide drug-like benefits and stop short of the extensive clinical trials and efficacy claims that approved drugs go through. Cosmeceuticals are pharmaceutical grade and, in some cases, regulatory-approved products for cosmetics, dermatology indications, etc. One of the most recognised cosmeceutical is Botox?, the derma filler for wrinkles sold by Allergan of the US. Botox? is an engineered attenuated version of botulism and is approved by regulatory authorities. Another approach is to combine pharmaceutical compounds with medical devices to create a therapeutic device. These therapeutic devices can deliver, be formulated into a drug and/or be used as a device itself with therapeutic benefits. The drug-eluting cardiovascular stents used in angioplasty to prop open an artery are a good example of therapeutic devices. Many devices are being developed to work in the eye and other organs to provide a more targeted, localised approach to therapeutic intervention. 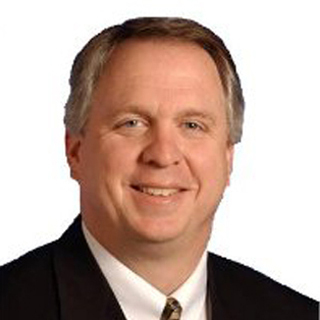 Neil J Campbell is currently Chairman and CEO for Mosaigen™, Inc., a global Life Science development corporation, located in Rockville, Maryland and Partner with Endeavour Capital in Asia. During his career, he has successfully developed and introduced over 200 products in healthcare, life sciences and information technology. He earned his MBA and MA in Management Systems from Webster University in Saint Louis, Missouri and his BS-BA from Norwich University in New England.